Are Retailers Missing Out on Mobile? When it comes to tallying up retail sales, it's easy to overlook the impact of mobile. Although millions of consumers spend hours a day on their smartphones, only a small number of transactions are actually completed on the tiny devices. In 2013, for example, $235.3 billion was spent online, according to ComScore. Among this number, only about $25 billion was attributed to mobile transactions. Despite the fact that these numbers pale in comparison to the over $3 trillion that was estimated to have been spent last year on in-store sales, the opportunity for these devices is much larger than it appears at first glance. A new study from Deloitte found that last year mobile devices influenced 19 percent of all in-store sales, giving them a $593 billion value. When accounting for all digital, including desktop computers, that number increases to $1.1 trillion—and it's growing fast. By the year's end, Deloitte predicts $1.5 trillion, or 50 percent, of all in-store sales will be influenced by digital devices. "The fact is, traditional retailers are leaving too much money on the table and are allowing strictly online retailers to capture a growing share of revenue that could be theirs," the study said. The results offer another piece of evidence that while consumers still participate in "showrooming"—a term for when they view a product in-store, then buy it online—what some have coined "webrooming" is just as real. Earlier this year, an IBM study found that in 2013, shoppers spent significantly less online after testing out or trying on items in-store. As that dollar figure has decreased, the number of shoppers first researching online, and then heading into the store, has risen. According to the Deloitte survey, 84 percent of shoppers used some form of digital device for shopping-related activities before or during their most recent store trip. That number drastically outweighs the results of IBM's study, which said the percentage of shoppers who showroomed last year was only 8 percent. The Deloitte study further showed that conversion rates rise when consumers use digital devices before or during the shopping process. In-store visits had a 61 percent conversion rate when no digital devices were involved. 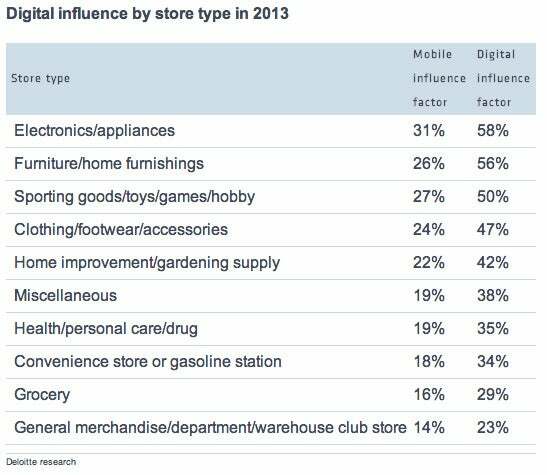 That number rose to 73 and 78 percent when these devices were used before or during in-store shopping, respectively. When they were used both before and during bricks-and-mortar visits, the conversion rate lifted to 86 percent. Contrary to what many expect, online sales tend to be higher in markets where the retailer has physical stores, said Kasey Lobaugh, a principal at Deloitte who led the study. "If you think about digital conversion, it can be a lever to drive store sales," Lobaugh said. "These numbers are without [retailers] even trying." Along those lines, Lobaugh said retailers simply aren't doing enough to integrate their online and in-store sales. The stores themselves need to offer free Wi-Fi, so consumers can easily browse the Web, and there should be signs teaching them what additional information they can pull up on their phones—for example, product reviews. Store associates should also be trained to refer shoppers to their mobile app and make its functionality part of the in-store experience. This will not only build brand loyalty among shoppers, but it will also give them a differentiated experience that can't be duplicated by online-only retailers, Lobaugh said. "There's this divide between what retailers are doing and what consumers are wanting," he said. "This is about getting inside of the heads and the needs of the consumer."